D’Place offers two styles of ticketing for our performances. When we expect a show to be lightly attended, we will designate the performance as General Seating. When we expect a healthy demand for tickets to a performance, we will designate the performance as Reserved Seating, so that guests can purchase the seat they want in advance and arrive to the theater, stress free, with just enough time to visit our Café or Concession Stand prior to the film. General Seating: For performances marked as General Seating, seats are not pre assigned. Guests are free to choose their seat once they arrive inside the auditorium. Reserved Seating: For performances designated as reserve seating, guests will be assigned a specific seat row and number at the time of purchase. The computer will start by assigning the best available, but in most cases, guests will have the option to pick the seats they prefer. Please understand that at times the system or box office employee may not allow a single unused chair to be placed between guests. Once the movie has started, guests are free to move about the auditorium and sit in any unoccupied seat. However, if a guest arrives bearing a ticket for the seat you occupy, you will need to relocate. Please note that seats in row Q are always reserved for guests who declare a disability or require accommodation. Seats located next to a wheelchair space in row Q are always reserved for guests who accompany another guest in a wheelchair. In either case, even though it may be possible to purchase a ticket in row Q, if you are sitting in one of these spots, you may be asked to relocate if another guest arrives who is deemed to have priority for row Q seating. Purchase of a seat in row Q is not a guarantee of a seat to the show. The managers decision in this matter is final. Mary Pickford is D'Place for the most comfortable seating. 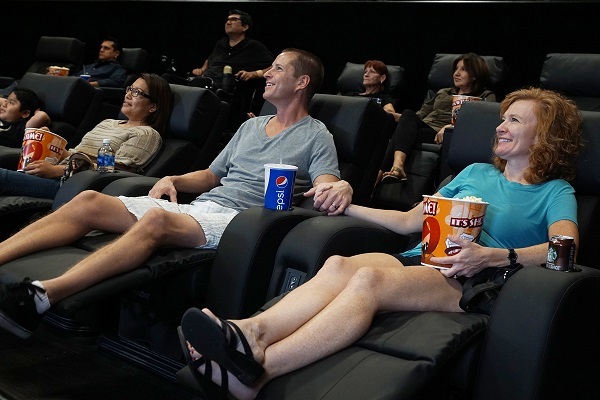 We feature motorized, plush recliners in 12 of our 14 auditorium. When selecting your experience, look for the Kick Back Seating Icon our website which will be listed with the film title. The same is true for our D-BOX motion chairs experience. We have two seating style options available. Recliner D-BOX will have both the D-BOX Icon and the Kick Back Seating Icon displayed with the film title. Our Grand House D-Box chairs will only list the D-BOX Icon. Seating for Escape and for our Grand House is Plush Rockers. These comfortable, plush chairs are the same style and comfort of our recliners but do not include the motorized leg lift. What you do get in these auditorium is our larger screen experience.